In honor of today being International Women’s Day and March being Women’s History Month, this post is dedicated to women. It’s dedicated to celebrating any and all of the inspirational women in our lives: our mothers, neighbors, grandmothers, mentors, teachers, sisters, cousins, aunts, and colleagues who bring laughter and wit and wisdom into our day and make the world a better place. Give them a call or a hug today. 3) a belly full of yummy, citrust-packed breakfast. Win! This was my first attempt at scones. Now that I know how perfectly easy they are, I foresee many a spontaneous batch of morning scones – with strawberries, blueberries, blackberries… the possibilities are endless! Preheat the oven to 400°F and place a rack in the center of the oven. Line a baking sheet with parchment paper and set aside. If you don’t have parchment paper, you can use a non-stick cookie sheet and lightly oil it with butter (this may work with a regular baking pan too, but you are more likely to have problems with the scones sticking). In a medium bowl, whisk together the flours, oats, sugar, baking powder, baking soda, ginger, and salt. Toss the grapefruit zest and orange zest with the dry ingredients. Add the cubed butter to the dry ingredients. Using your fingers or a pastry cutter, rub or cut the butter into the flour mixture until it resembles small, coarse peas. Work quickly so the butter doesn’t warm too much. Add the yogurt and honey, and toss everything together with a fork and/or your hands until all of the dry ingredients are moistened. Add the grapefruit pieces last. Quickly and gently envelope them into the scone mixture. 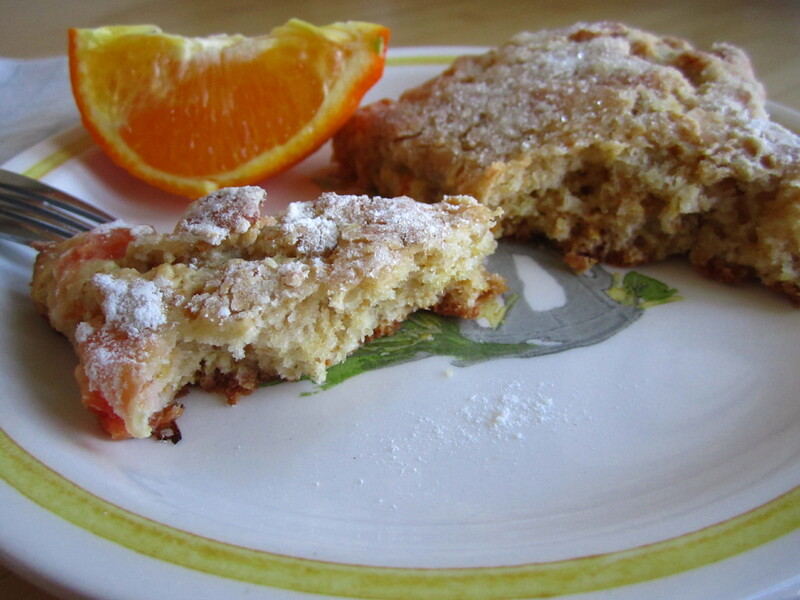 You don’t want the grapefruit chunks to become smashed or release much juice as that will alter the texture of your scones (though some smashing is unavoidable). Turn the scone dough out onto a floured surface. Gently form into an 8-inch circle, about 1-inch thick. Cut the dough into eight triangles using a knife. If the dough is moist, lightly coat with flour on both sides and edges (this will keep the grapefruit juices from leaking out and burning). 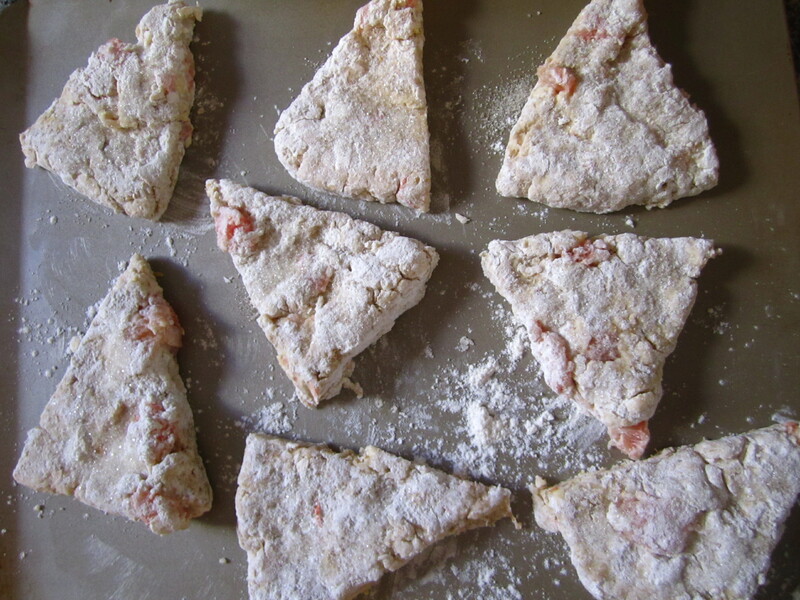 Using your hands or with a spatula, place the triangles on the prepared baking sheet and sprinkle the tops with sugar. Bake for 18-20 minutes, or until golden brown on top and firm but soft in the center. Cool for 15 minutes before serving. • How To Segment the Grapefruit: Slice off the bottom and top of the grapefruit and use a sharp knife to cut away the peel and white pith. 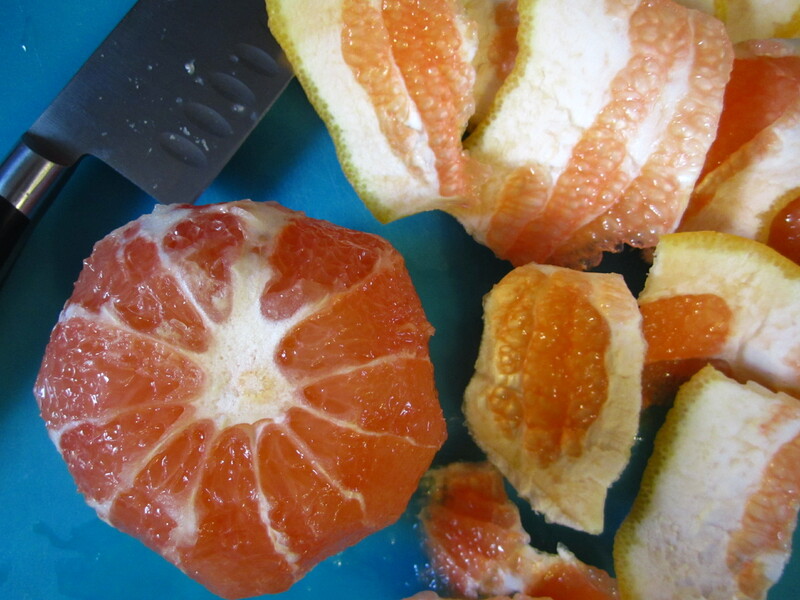 Slice in between the white skin segments to release the wedges of fruit. Chop each segment in half and set aside. If you’ve never sliced a grapefruit, see this quick video tutorial. 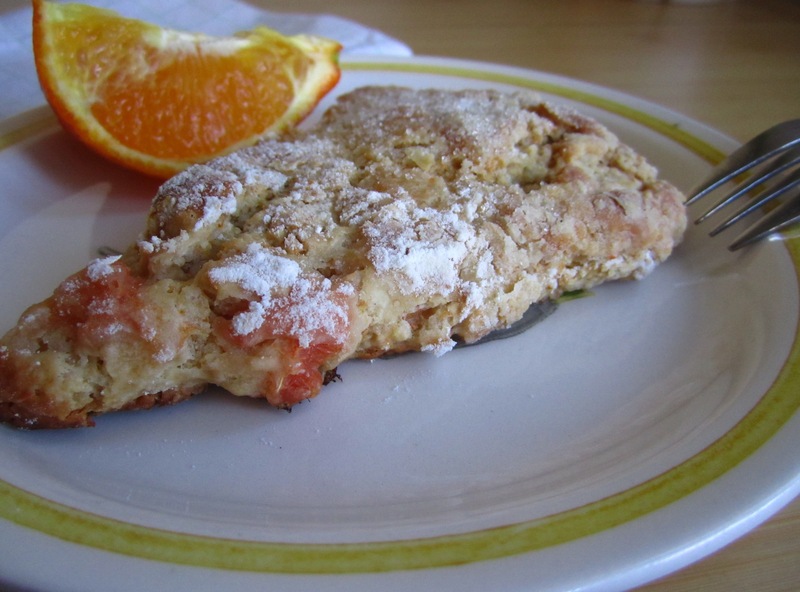 This entry was posted in Not pie and tagged grapefruit, scone. Bookmark the permalink.